Well, I hope enough time has passed for Texans fans can think reasonably about this past season, and call it a successful season. Did they win the Super Bowl? No. Was it always pain free watching the Texans? No. But, objectively, it was a successful season. I understand it was a disappointing end with the team playing poorly down the stretch—not clinching home field advantage, and ultimately losing to the New England Patriots. But let’s not forget that they started 11-1, and finished 12-4 (only one other Houston NFL team did this before, 1993 Oilers), hosted a wild card game, unleashed JJ Watt on the NFL, and played without defensive leader and stud Brian Cushing for the final 13 games of the season. If I would have told you before the season that they were going to go 12-4, Texans fans would have been elated. It was the how that bothered most fans. Matt Schaub is not elite, but he isn’t as bad as ‘the-sky-is-falling’ Texans fans think he is. He had the 9th best passer rating in the NFL, threw for over 4,000 yards again, and went to the Pro Bowl again. Arian Foster led the NFL in touchdowns and rushed for over 1,400 yards (6th in the league). Mr. Reliable, Andre Johnson, was second in the league in receiving with nearly 1,600 yards. Let’s not forget JJ Watt’s historic season. He led the league with 20.5 sacks, but he was also top 10 in passes defended with 16—unheard of for a defensive lineman. He was the Defensive Player of the Year! For those looking for wholesale changes, prepare to be disappointed. This team is not that far off. Also, they don’t have that much cap space to use to maneuver. Plus, its not their style. Here are my top off season priorities (in order) they need to make happen. 1. Re-sign Glover Quin. He is an unrestricted free agent, and he is priority #1 for the team. Quin is entering his prime at Free Safety, but he also provides the Texans flexibility with his ability to cover slot receivers and TEs really well. Also, besides his aging (regressing?) safety partner, Danieal Manning, there is NOTHING of quality or depth at this position. And remember, he shares the defensive backfield with Kareem Jackson. I know he showed a little progress, but I think we’ve seen his ceiling. 2. Let Connor Barwin walk. He’s an average starting linebacker who all too often rushes past the quarterback letting the QB just step up and complete a pass. He’s had one successful season in his 4 years in Houston (He missed most of the 2010 season with an injury.). Its not that Barwin doesn’t have talent or skills. Rather its that those skills are probably going to get more money than the Texans should pay him. There’s no value here. Think Mario Williams on a smaller scale. The franchise tag for an OLB will be around 9-10 million. Do you want the Texans paying that for a guy who had 3 sacks last year in 18 games? I don’t. 3. Get Stronger In the Middle of the Defense. We need to add more of a young, beefy stalwart at NT to start in front of either Shaun Cody (free agent who just underwent back surgery) and Earl Mitchell (somewhat talented and scrappy). Wade Phillips defenses of years gone by have typically been bigger players. Think Ted Washington and his 330 lbs. with the Buffalo Bills. The best NT in this draft is Jesse Williams from Alabama. I think he’s a stud, but he’s not the Texan’s type of player. Example: he has a head tattoo that reads: Fear is a liar. That doesn’t sound like Bob McNair’s type of guy. Also, we need more quality and quantity ILBs. When last season ended, we were lining up Barrett Ruud and Bradie James at that position. Both need to not be on anyone’s roster next year. Both of them are still trying to find Aaron Hernandez running behind them. After we lost Brian Cushing, this position became a glaring weakness. Darryl Sharpton is talented but often injured; you can’t rely on him. I like Tim Dobbins, but as depth not as a starter. 4. End the Lestar Jean Experiment. Speaking of guys who can’t stay healthy. I was once very intrigued by the small school (Florida Atlantic) Jean. He’d flash and make brilliant catches in practice or preseason, but could never really duplicate it in regular season action. He’s certainly big and explosive, but we need reliable options. DaVier Posey (pray his achilles rehab goes well) and Keshawn Martin (freaking catch the ball!) are now our young guys who we hope pan out. We need another WR who is capable and trustworthy. Jean is not that guy. We need to not waste the rest of Andre Johnson’s greatness. I like Kevin Walter and see what he brings to the team. I’d still like them to sign an experienced WR. The top free agents (Greg Jennings, Mike Wallace, Dwayne Bowe, and Wes Welker) are out of their price range, so let’s hope Rick Smith can work his magic on the second tier of available receivers. But the answer certainly is not Lestar Jean. 5. Draft well; make use of all your picks. The Texans have the 27th pick in the first round. The first round gathers all of the love and attention, but you build your team throughout each round not just night one. As far as I know, the Texans have all seven of their draft picks, plus they could gain 2-4 compensatory picks for losing free agents last year (M Williams, J Allen, M Briesel, and J Dreesen). We will know more about these in late March. Regardless, we need to make every pick count and draft well. I’d like to see this team draft the best safety or corner it can get in the first round, followed by the best wr it can get in the second round. Then I’d like them to spend the next few rounds focusing on ILBs and the right side of the offensive line. 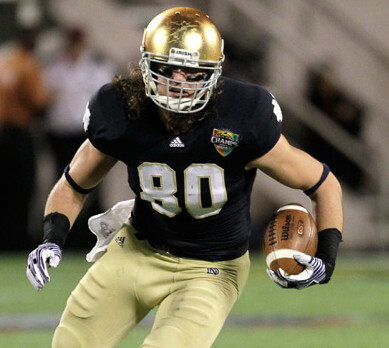 If we ever have a shot to draft a special TE (Ertz-Stanford or Eifert-Notre Dame), I say take it. We are seeing the evolution of TEs, and we all know that Kubiak and this offense depends on multiple TEs. Posted on February 22, 2013 by Matt Killian and filed under Sports and tagged Texans NFL Draft NFL Matt Schaub Connor Barwin Glover Quin.